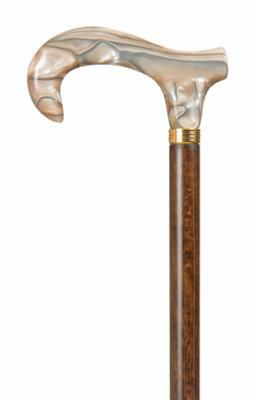 A very striking and stylish cane, perfect for everyday use as well as smart occasions. The smooth acrylic handle is in the 'derby moderne' style, an elegant variation on the traditional derby. It feels very comfortable in the hand and provides excellent support to the user. The handle is a sophisticated, marbled blend of gold, beige and dove-grey colours. The shaft is brown beechwood, fitted with a smart metal collar and neat, non-slip rubber ferrule. Ferrule diameter 16mm. Overall height 92cm (36").